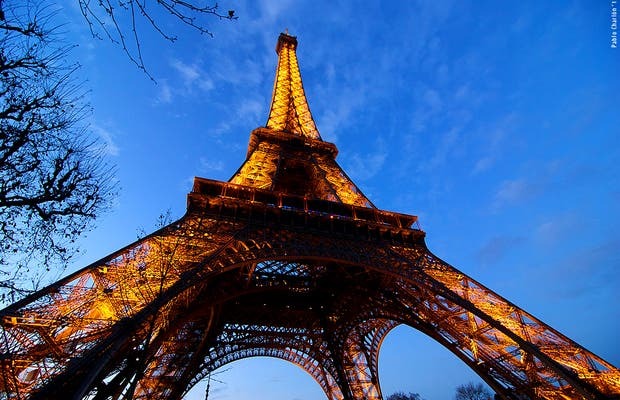 The Eiffel Tower is a symbol of Paris. It was built during the 1889 Universal Exposition and at 320 meters tall, was the largest structure in the world at the time. Due to its popularity, the Tower was left standing after the Expo and has since become the defining icon of the Paris skyline. The elevators on the north and west legs connect the three viewing platforms. You can visit the second platform by elevator or stairs, but be warned that there are no less than 1665 steps. As an anecdote, it’s a rather common occurrence to see couples proposing on the tower. Also, every night the twin lamps on the Eiffel Tower shine out for 80 kilometers. I arrived at the Eiffel Tower through the Trocadero and the experience of seeing it past the Palais de Chaillot is spectacular. I still hadn't seen the tower from anywhere else in the city and I was delightfully surprised. Before going on, I’d like to mention that you should pay attention to the Palais de Chaillot, a neo-classical building built for the Universal Expo, the Gardens of the Trocadero, and the Pont d’Iéna as you walk towards the tower. I didn't go up the tower because I’m not good with heights, but walking around the base is just amazing. Oh, and you can’t miss seeing it at night when it’s all lit up. This picture is from my first trip to Paris a few years ago and seeing the Eiffel Tower in person was simply an amazing experience. I stood on the shore of Seine watching the Eiffel Tower's lights sparkling in the night, and it was such a magical moment. It seemed to me like the Eiffel Tower was taken straight out of a fairy tale and appeared across the Seine to mesmerize spectators. At nightfall, several projectors illuminated the Eiffel Tower bathing the structure in gold. And the beacon on the top sent out two light beams visible from far away. The multiple sparkling lights lit up the sky around the Eiffel Tower. They sparkled for 5 minutes every hour on the hour, captivating the interest of people as they marveled at the wonder and the majesty of the Eiffel Tower. This restaurant is on the Paseo de Blanes, near the seaport. It's surrounded by a pizzeria that was a marine surprise. The Andalusian calamari, mussels and clams in white wine were amazingly freshness. They have a great assortment of meats. The kangaroo meat al Oporto was excellent, more mellow than beef with a very similar flavor. Definitely recommended. Eiffel tower is just mesmerising - exactly how it is told to be. The seine river flowing beside only adds to its charm. Taking a walk along the river banks you only wait for the evening sky to light up with lights from the Eiffel and as soon as the tower sparkles your heart skips a beat. It is indeed a lovers paradise. A definite must visit for everyone. I would love to go back whenever I have the chance! The Blanes Botanical Garden sits atop a cliff on the Costa Brava. The garden is divided into regions of the world where you can see different species of plants. The garden also has a pond where you can admire the flora and fauna that come with it. The best part of this garden is the ocean view that it offers. We bought the ticket on line with scheduled hour to visit, it was fast and easy. The view of Paris is just amazing. No need to go all the way to the top, we stayed at the third floor and it was already worth it. My aunt was pulling me through the crowd to purchase tickets to ride up the Eiffel Tower. I knew I had to get a picture of the lights, so I looked up, framed my shot as quickly as I could, and stole the moment in time.